With the plethora of aero bikes currently being released across the market, we have a fair share of fast bikes in our stable here at RBA which we have accumulated for an upcoming “aero” issue where we will put them up against each other. The Factor One is one of the first bikes which we have been putting some time in on, and after a couple of rides the bike has really stood out. 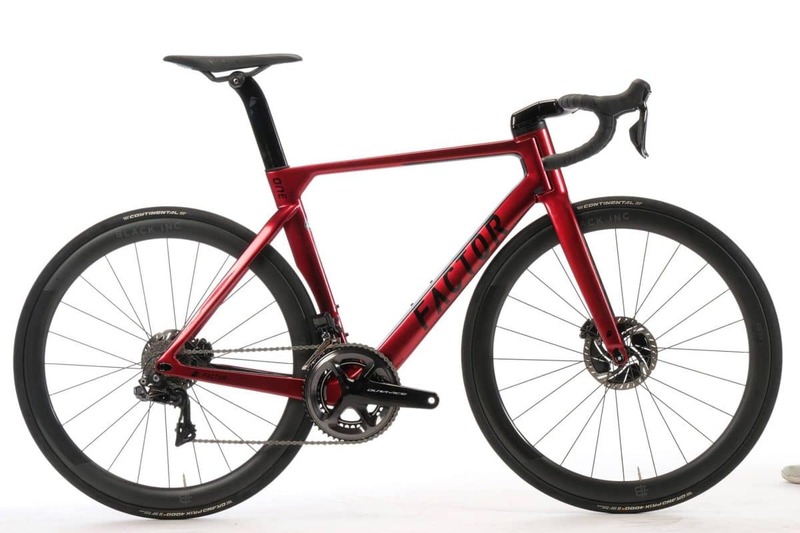 One aspect which we like about the One is that it truly does look like an aero bike as many of the new bikes which have been released are starting to all look very similar. Other then the beautiful metallic red paint job on the One, the two aspects that stand out are the external fork and split down tube. The Twin Vane Evo downtube is designed for maximal stiffness and better aerodynamics with better aero – flow. The OTIS external steerer fork is not your traditional fork which has been designed for a more stable front end feel with aerodynamic gains. Jumping on the One you can instantly feel a difference in the front end because of the external fork. Not in a negative feel, but a different feel from your traditional fork. Once getting used to the feel of the One the two aspects of the bike which stand out is that it is fast, and it is stiff. Once getting up to speed the One rolls very quickly, and is very stable. The OTIS Evo aero bar has a great shape to it as most aero bikes are now going to their own proprietary one piece system. A downside with this though may be the bar shape can be on the larger side and not the most comfortable, but Factor has put together a great bar with a good shape. We even used this one piece bar on one of our project builds for the Dirty Kanza gravel event. We’re looking forward to getting in a bit more time on the One for our aero issue, but our First Ride feelings for this bike are very positive, though the price tag is on the higher side. The external fork stands out among other aero bikes which is noticeable while riding. The twin down tube is a head turner anywhere you take it. The one piece bar/stem system hides all of wires very cleanly.